Speaking of enshrinement, Hunter's poster image shares one similarity with his HOF plaque--no cap insignia. 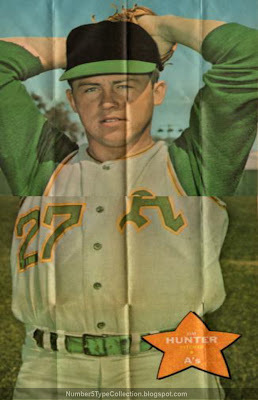 A photo editor curiously wiped away Oakland's "A" on the hat, but left the uniform alone. (The middle crease proved hard to scan, so looks broken. It's all there in real life.) Not Topps' worst airbrush effort ever, but you can see it from here. 1968 Topps posters measure about 10" x 18" and sit between adjacent years both chronologically and sizewise. UPDATE: Catfish as a hitter? Baseball-Reference's blog listed most hits in a season without extra-bases and Hunter appears not far down the list with 23 singles in 1972. Guess he didn't even have "warning track power." Value: 1968s are hard to find today, especially relative to cards, being both lesser-printed and easier to damage. Expect to drop $10 - $20 for one in decent shape and more for superstars like Aaron, Mays, and Mantle.